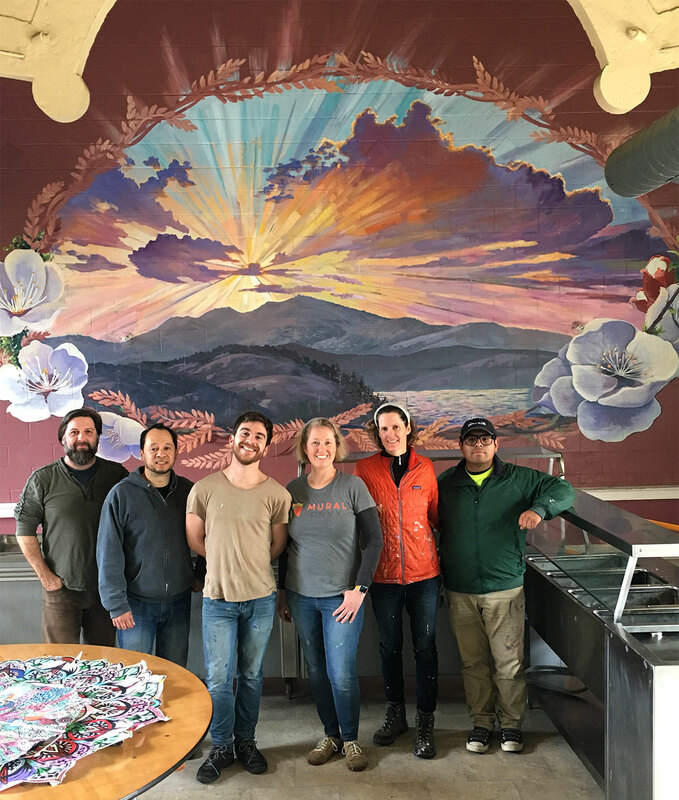 I spent the past week painting with a team of professional mural artists painting at The Julian Inn, a facility run by the Bay Area based non-profit LifeMoves. The Julian Inn has a month-long waitlist for one of its 80 beds and offers 90-day shelter to those who are homeless. 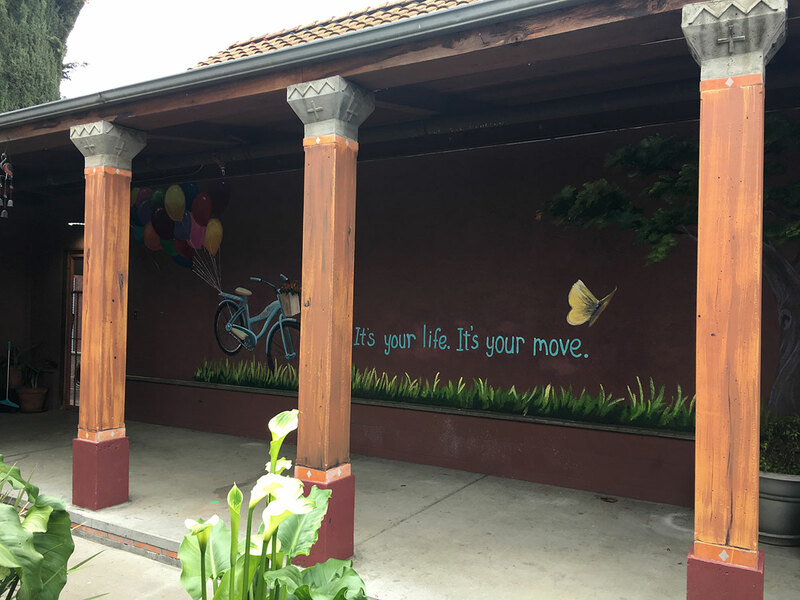 Although about half of the 750 individuals that LiveMoves serves in all its bay area locations on a given night are children, The Julian Inn location serves adults only and provides 3 meals a day and programming to support the resident’s transition to stable lives and long term self-sufficiency. The LifeMoves management impressed me with their wholehearted enthusiasm for this beautification project. We started out with a facilities walk-through with the center director, Lindsy, the facilities manager, Antonio, and the Vice President of Real Estate and Operations for Life Moves, Joanne. We identified the dining room and entryway courtyard area as places that could benefit from art. I was also seeking shelter myself, in a way. I had scheduled a mural painting workshop for the week, but all of the walls I had lined up for the event were exterior exposed walls, and the forecast threatened rain all week. LifeMoves organized all the logistics for me in short order with trusting in my process and the team I would bring to execute the work. My students and I sat down with the center director Monday morning and learned about the history of the space, how it was used, and what her hope was for the artwork. The words that came up the most were “safety”, “sanctuary” and “welcome”. My students and I spent an hour sketching and batting around different ideas before we came up with our design. We pitched it to Lindsy and she loved it and we were at our brushes the same day. The sunset idea was an opportunity to bring a warm panoply of color into the room, a simple expression of a new beginning and also be interpreted as a refuge at the end of the day. The wheat around the sides and the fruit blossoms alluded to the purpose of the room, providing three meals a day. Give us this day our daily bread. Jordi Cardenas hails from the Netherlands and received a scholarship from the Reynolds Foundation to take the class. He has worked in restoration while developing his fine art. 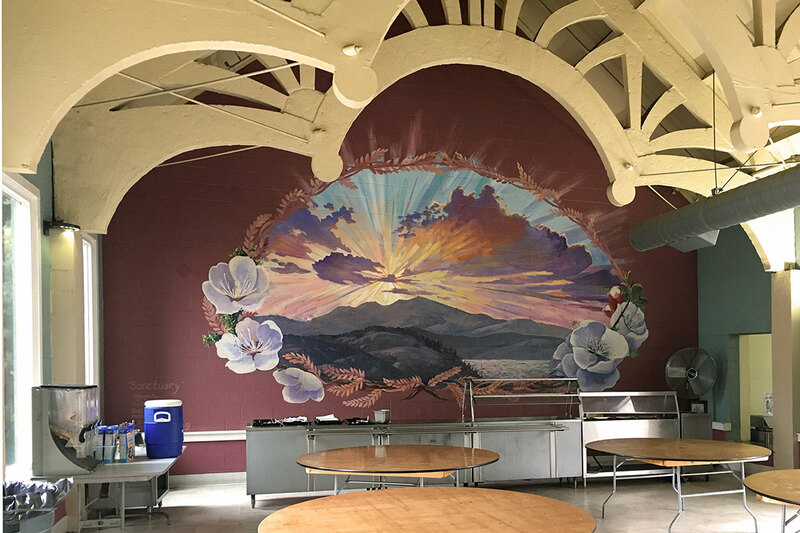 He had only painted 6 murals before the class but realized that mural painting perfectly fused his skills and interests, so that is now his creative focus. 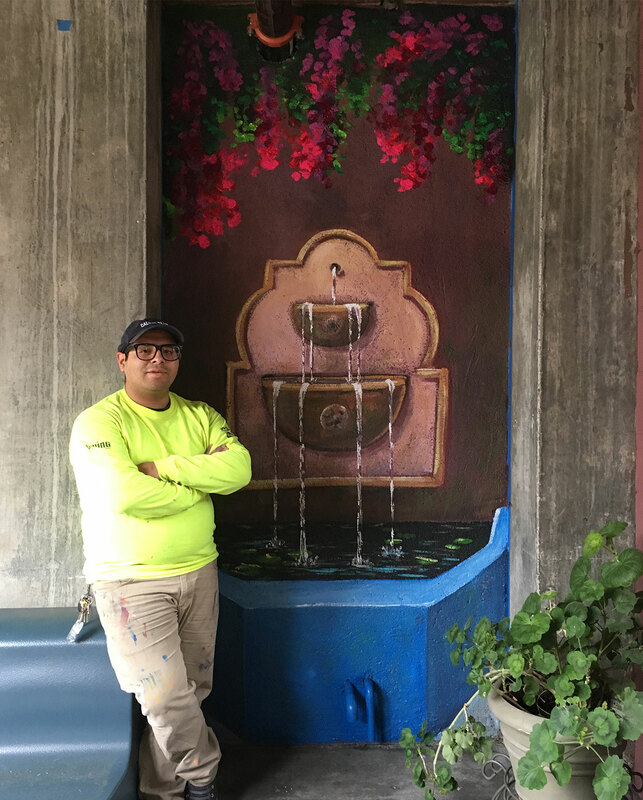 Miguel de la Rosa is a bay area chalk art specialist, mostly signs for businesses, but now branching out into larger scale mural work. He is king with the lettering, so this week I stretched his comfort zone and kept him on flowers and balloons. 😉 Find him on Instagram at miguelchalksigns. Toni Miraldi hails from Connecticut where she runs Mural Envy , which creates clean and colorful illustrative style murals in, predominantly in public and commercial spaces. She spent a career in interior design before switching over the fun of mural art. Jorge Juarez is based in San Jose and runs Koichi Arts with his partner Mark Marquez. They specialize in murals with a modern, pop-art style as well as graffiti art. The team was rounded out by Lane Pianta , who contributed substantially to the artwork but by profession is a grant writer. He is developing a curriculum for a mural painting program for at-risk youth in Redwood City. He provided great insights to the group about the grant writing process, and the opportunities available there, and we made sure he got some paint on his clothes. I am so proud of these artists for investing in their careers, to learn new techniques and business ideas. 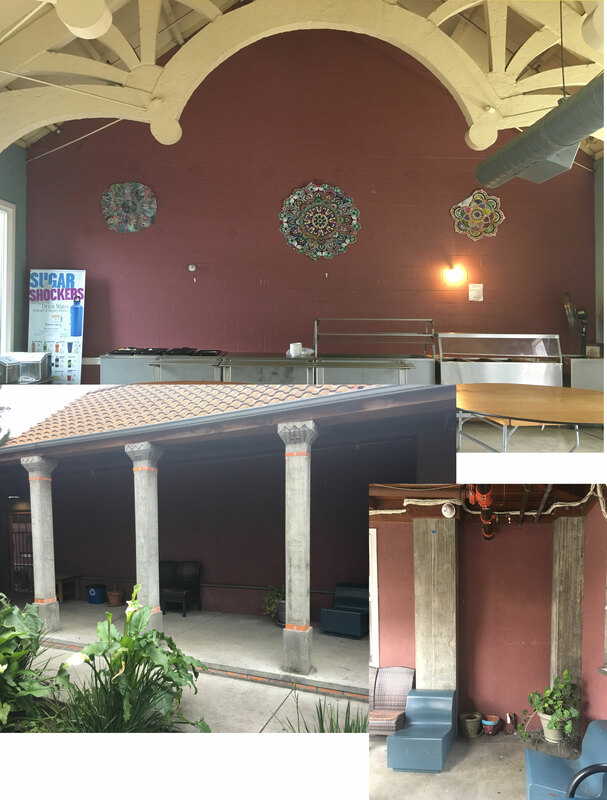 I am also proud of the legacy we left as a team, the dining room and courtyard transformed with art. Each morning we spent an hour talking about how to better share our art and make a living doing it, and then we would launch into the painting. Each student already has a well developed individual style, but was willing to embrace the loose, painterly style I favor; leveraging a large brush and great enthusiasm, and letting the work emerge from the layering of colors. The Julian Inn serves the members of our community facing life’s most difficult challenges, Many of the residents are struggling with addiction or mental illness, and all are struggling to find a foothold of stability in life. 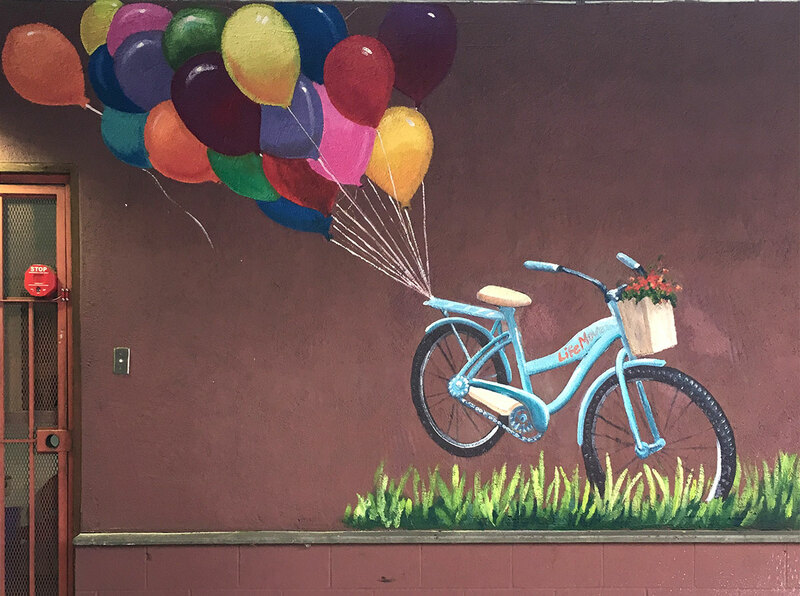 I would like to dedicate these murals to the center director, Lindsy, who shows up with clear integrity to support the residents to feel seen, welcome, and to get the support they need. She is a jewel who is not jaded. There are lots of cushy job to be had with someone with Lindsy’s skills, and instead she has chosen to make a difference in a part of our world most of us would prefer to not see. Putting color on the concrete columns made a big difference. Last year, 89% of families and 73% of individuals completing LifeMoves interim shelter programs successfully returned to stable housing, equipped with the life skills and competencies needed to maintain long-term self-sufficiency. I was reminded on this project that my comfort zone could use a little expanding. I felt ashamed when I realized I am frequently guilty of not making an effort to reach out to individuals who have low visibility in the community. The discomfort, inconvenience of me noticing the edge of my comfort zone, is robbing another human being of experiencing the dignity of being seen. A smile, a hello, being seen, is oxygen for our humanity. I am reminded of how I used to avoid eye contact and interacting with teenagers in public spaces. Crazy makers, fear of being teased, a bundle of biases, all very subtle but enough to deter me from making a connection with teenagers I didn’t know. Now that I have teenagers, and l now know them to be complicated and amazing and sensitive to how they are seen and treated by adults. The familiarity of their struggle is there. These days when I see a teenager, I am more likely to offer a smile, an “I see you, and you’re alright” nod. I have a family member I love dearly who has struggled with homelessness. It is my love for that person, the familiarity, that gave me a foothold to expand my comfort zone last week. It took a few days, but I started making better eye contact, learned a few names, handed out more high fives. Our brains get short-circuted by shame. If we are gentle on ourselves, and remember it is more likely just a small case of the unfamiliar, we can stop being part of the problem, and instead become part of the solution. If homelessness in the bay area is an issue that concerns you, something you can do is volunteer or donate to LifeMoves. Wishing for you shelter. Wishing for you safety. Wishing for you to feel seen. P.S. Check out my latest podcast with Chris Beth , Director of Parks and Rec in Redwood City about how public art has helped to transform that community.